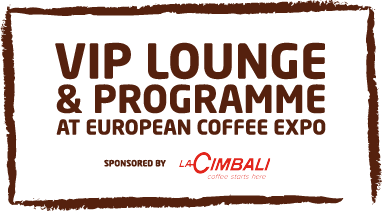 The VIP Lounge at European Coffee Expo will be a haven in which to relax or network with other specially invited guests from within the industry. It will also be the perfect place to enjoy a delicious freshly brewed artisan coffee …..
As sponsors of the VIP lounge, La Cimbali will showcase its most technically advanced, feature rich, traditional espresso and superautomatic machines which will be running with premium artisan blends from market leading coffee partners. On demo will be the M100i Intelligent Milk traditional machine with Elective grinder doser. With Bluetooth technology, intuitive touch screen interface and the Barista Drive System, it has never been so easy to achieve exceptional in cup quality, that’s guaranteed. VIP guests can also experience the S30 Perfect Touch superautomatic which offers all the benefits of automation and speed of service yet can deliver speciality coffee on a par with a traditional machine in terms of output quality, taste and aroma. One S30 will set up in a fully automated self-serve mode plus a second machine will demo Turbosteam4 so guests can see just how easy it is to create velvety smooth, perfectly prepared foamed milk to a consistent standard in an instant.